*This BL-80 mini projector adopted the lasted upgraded LED technology, provides more brightness than ordinary LED projector with 1200 Lumens. In dark room you will enjoy sharp image. *super compatibility with multi projection support vga,hdmi,usb,headphone,av,sd,mobile phone,ipad,dvd,vcd,tv box etc. *2. 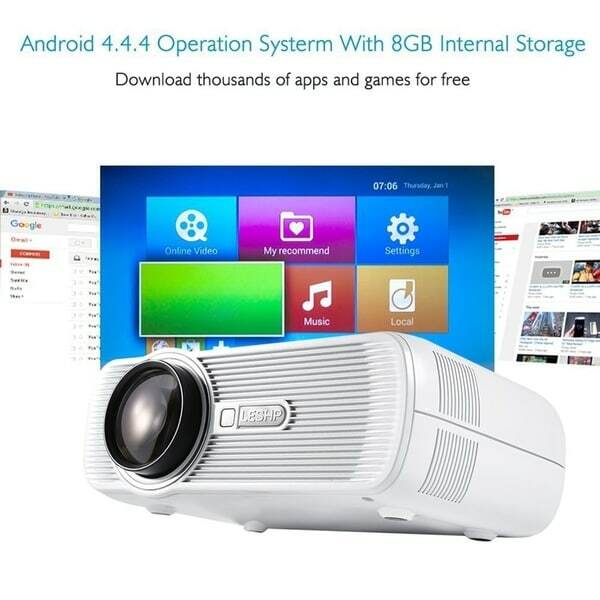 To connect the mini projector with PC/Laptop, please adjust the PC/laptop display resolution to 800*480or 1920*1080, which can provide the best clarity. And choose the"Multiple display"as"Duplicate these displays. Dimensions 11.81 In. X 3.94 In. X 7.48 In. Its *** bad the picture is super small, The adjustment button was broken and I was not able to focus the picture. It says it has speakers installed my S7 is louder than that, I would not recommend this product to anyone STAY AWAY!!!!! I expected it to hook up through Bluetooth but it does have to be plugged into the computer, still very cool, works well! My daughter loves this new room accessory. No number to call for tech support. And no company name on instructions or product that I can find. Wouldn't even know if it's good. Can't get it to work. Need more info, but how do you get it. Rating as a 5 for the affordability and also the item was shipped and delivered quickly as promised. I would definitely refer my friends to shop with overstock and this vendor. Item was purchased as a gift and hasn't been used yet. I will be using it to show theatre style videos for the fun of families.